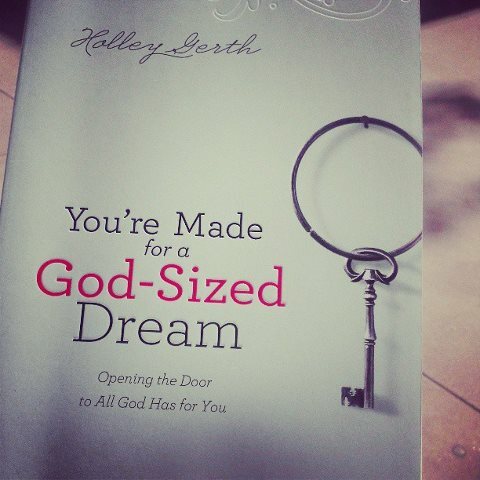 Reading another GREAT book, You’re Made for a God-Sized Dream by Holley Gerth. I’ve been posting all over my facebook page as a result of how this book is touching my heart, but one simple part in my reading today has really caught my attention. Holley writes, “You are the only you we have. That means your God-sized dream either happens through you or not at all”. Wait, what?! This line reminds me of a saying I hear in my Mary Kay business, “if it’s meant to be, it’s up to me”. So much truth in this right? Of course it must also be in God’s will, but if we take no steps towards doing anything then we forfeit the God-sized dream all together. So what about those who don’t know what God-sized dreams exist in their life? Does that mean that life is wasted and there is no point? NO! It means that while we seek and discern what God-sized dreams to take part in, God is ready and waiting to use us right where we are and all along the way! I posted a question as part of an assignment in my study. Simple question, “what 3 strengths do you see in me?”. In return I responded with 3 strengths I see in them. I am blown away at the response! Honestly, I grew more when I was able to praise God for the 3 strengths they each have that I am blessed by. I am plain and simple me. Nothing extravagant. I’m not perfect. I can be grumpy, easily overwhelmed. I snap at my children occassionally. I have lazy days. I make many mistakes and God makes sure those humbling mistakes continue to shape me, but when I respond to God’s call right where I am, He uses me. I’m willing to be transparent. I am willing to admit my faults and correct them so I can be of more use to Him. What people see as strengths in me they see because God uses those strengths to touch the lives of each one of the people who answered my question. He doesn’t use me because I’m only strengths and no weaknesses. He uses me because despite my weaknesses, he’s gifted me strengths to make a difference. He has made me ME and nobody else can fulfill the tasks He has willed for me. Nobody else can fulfill the tasks He has willed for YOU! Don’t waste time trying to be something or someone you’re not, but work on being YOU…the you He’s uniquely created you to be and praise him for choosing you right where you are. Ask him to equip you and use you. Praise Him for growing you to fulfill the God-sized dream he has set aside for only you to do and then go for it with all you have in you because nobody else can…nobody else will.